DRC President Felix Tshisekedi receives a special gift from the Founding Father Sam Nujoma. Felix Tshisekedi, President of the Democratic Republic of Congo, DRC, ended his official visit to Namibia on Wednesday after a series of activities with his host Hage Geingob. Having arrived on Tuesday and holding a joint press conference with Geingob, Tshisekedi who was accompanied by his wife were hosted to an official dinner in his honour. A highlight of his engagement on Wednesday was meeting with Sam Nujoma, Namibian revolutionary and its first president. 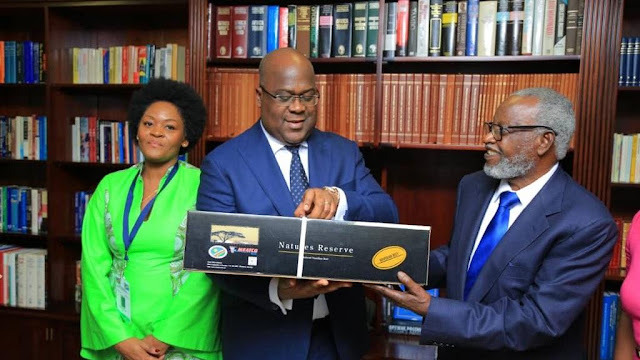 The DRC presidency said Tshisekedi had paid tribute to Nujoma who was described as one of the fathers of pan-Africanism. The two were pictured in a warm embrace with smiles. Full name, Samuel Shafiishuna Daniel Nujoma, is revered as a revolutionary and anti-apartheid activist. He transited into politics and served three terms as the first President of Namibia, from 1990 to 2005. The octogenarian was a founding member and the first president of the South West Africa People’s Organization, SWAPO, in 1960. End of the official visit to the Republic of Namibia HE Félix-Antoine Tshisekedi and the First Lady. The party is still the ruling party under the leadership of President Hage Geingob. 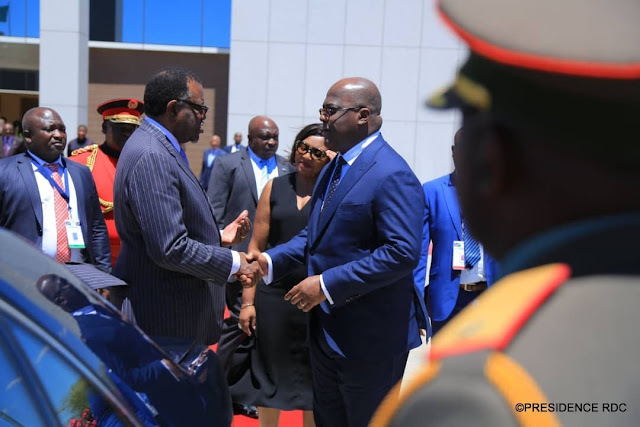 Tshisekedi also met with the Congolese diaspora in Windhoek at the Hilton Hotel giving assurances of his plans for the country that has been riled by violence and which continues to grapple with human rights concerns. Namibia was the second country in the southern Africa region that he has visited. His first stop was in Angola. He has also visited Kenya, Congo Republic, and Ethiopia, where he attended his first African Union summit.